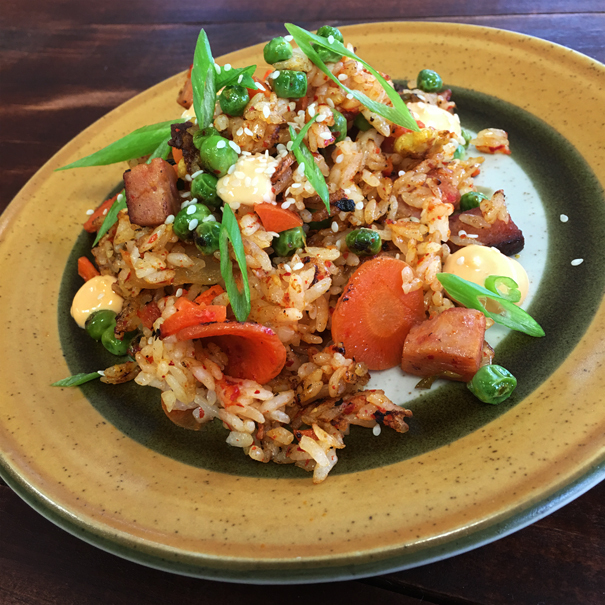 Kimchi Fried Rice is as simple, and as delicious as it gets. A staple dish for anyone feeling a need for something rich, comforting, and even hangover blasting. When I make kimchi fried rice I like to serve it with a fried egg, maybe some left over pork belly but i think today i'll be using SPAM. I also like to add Gochujang to my kimchi fired rice. Gochujang is a red chile paste that also contains glutinous rice, fermented soybeans, salt, and sometimes sweeteners. Kind of a spicy chili-miso kind of thing, it's a thick, sticky condiment that's spicy, sweet and umami rich. It is the backbone to Korean cooking and I would wear it as cologne if it were socially acceptable. Heat levels of Guchujang can vary between brands, so check the packaging to see if it's labeled with any kind of spice-level indicator. In a nonstick sauté pan or well-seasoned cast-iron skillet, melt butter over medium-low heat, and add onions. Cook, stirring, until the onions start to sizzle, about 2 minutes. Add diced SPAM and peas and saute until SPAM begins to crisp. Add kimchi and saute until sauce is nearly dried out, about 5 minutes. Add rice, reserved kimchi brine and turn heat to medium. Cook, stirring, until the rice has absorbed the sauce and is very hot, about 5 minutes. Stir in sesame oil. Taste, and adjust with more soy sauce, sesame oil or kimchi juice. Turn heat down slightly, but let the rice continue to cook, untouched, to lightly brown. Sprinkle with green onion, serve immediately, watch some Netflix.